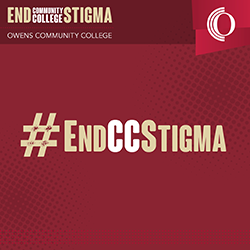 Thank you for visiting the Owens Community College website and reviewing our privacy statement. Owens Community College does not collect personal information about visitors to our website unless you choose to provide that information to us. Owens Community College does not sell, exchange or release information gathered from your visit to our web site to parties outside the College without your consent. Once we obtain your consent, we consider it valid until revoked by you. The name of the domain from which you access the Internet (for example, Verizon, Roadrunner, Comcast, SBC / AT&T). The pages, files, documents and links that you visit. The Internet address of the website from which you linked to this website. The Owens Community College website will only collect personal information which you knowingly and voluntarily provide by, for example, sending emails, completing membership forms, registering for classes, events, or other programs, responding to surveys or ordering merchandise. If you provide us with personal information, we will normally respond to your inquiry, request or order. We may also contact you to provide information about College activities, programs, membership and development opportunities and special events that may interest you. We need to send your information to companies who work on behalf of Owens Community College to provide a service or product to you. We find it necessary to protect and defend the legal rights and/or property of Owens Community College. Student directory information may be released without the student’s written consent. Directory information includes: name, address, email address, I.D., photo, telephone number, date and place of birth, major field of study, participation in Owens Community College activities and sports, weight and height of members of athletic teams, dates of attendance at Owens Community College, degrees, certificates and awards received, and the most recent previous educational institution attended. If you do not want your directory information released, you must complete this form requesting it not be released and file the form with the Records Office. Owens Community College is a large organization with many people sharing responsibility for the content of our website. If you have questions about this Privacy Statement, please contact us via email at webinfo@owens.edu.